It took him nearly 40 years to do it, but it was entirely worth the wait. Paul McCartney, still slender and gorgeous at 63, returned to the former Seattle Center Coliseum, now KeyArena, for the first time since the Beatles' hysteria-inducing performances of the mid-1960s. With a four-member band led by keyboardist Paul "Wix" Wickens and featuring lead guitarist Rusty Anderson, McCartney led a capacity crowd -- mature, but no less enthusiastic than the screaming hordes of the '60s -- on a celebratory journey through his musical past, from the Beatles and Wings to songs from his new solo album, "Chaos and Creation in the Back Yard." Scheduled to start at 8 p.m., the concert was delayed by at least 30 minutes and began with a pre-show DJ and 10-minute film on McCartney's life and career, from the bombing of London during World War II to the recent Live 8 concerts. Dressed in black trousers, turquoise shirt and black sport jacket, McCartney launched the show with a boisterous "Magical Mystery Tour," the first of more than a dozen classic Beatles songs. McCartney stuck to the 36-song set list featured at other recent shows. The show featured several songs at the piano and a three-song acoustic set that began with the '50s-sounding "In Spite of All the Danger," the first recording made by McCartney, John Lennon and George Harrison in their pre-Beatles days. Among the best songs from his new solo album was the somber, sentimental "Jenny Wren," which closed the short solo set. McCartney played a vintage Hofner bass guitar, an instrument featured on a number of older songs. For his solo song "Flaming Pie," six light clusters above the stage appeared like space-age chandeliers. Above the stage was a giant LED screen showing close-ups of the band. Behind McCartney, Wickens, Anderson, guitarist and bassist Brian Ray, and drummer Abe Laboriel Jr. was a giant backdrop of video panels displaying animated imagery and documentary footage. "Greetings, Seattle," McCartney cheerfully announced before a spirited version of "Jet." "We have come for many miles to rock you tonight -- and we will." "Drive My Car" was accompanied by vintage films of 1950s dream cars. McCartney introduced the sentimental "Till There Was You" as a "smooching song" from the Beatles' cabaret days. The song was accompanied by a backdrop of clouds and blue sky. "Let Me Roll It" featured a snippet of Jimi Hendrix's "Foxy Lady." For "Fine Line," the first song from his current solo album, a piano rose from the stage floor, and McCartney joked about falling into the hole on the second night of the tour. Anderson induced the new song by tossing a fortune cookie into the crowd, then reading the fortune aloud: "Now is the time to try something new." Another charming song from his current solo album was the delicate, sentimental "English Tea," accompanied by an animated English garden scene complete with oversize butterflies. The song featured the entire band, except Anderson, who returned for the Beatles song "I'll Follow the Sun." "Blackbird," "Eleanor Rigby" and "Good Day Sunshine" were highlights of the show's second hour. 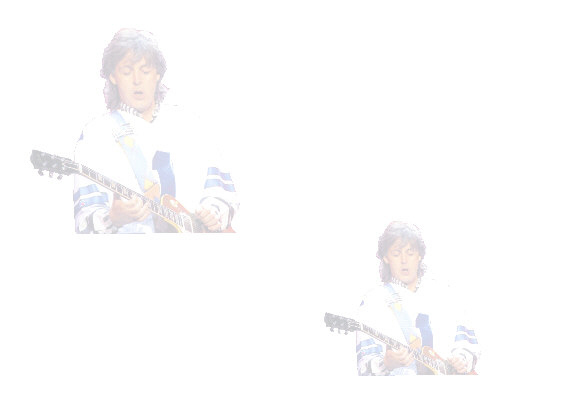 McCartney proudly mentioned that "Sunshine" had been used last summer to awaken NASA space shuttle astronauts. The beautiful "Blackbird," he explained, was adapted from a J.S. Bach piece. Pyrotechnics were featured on "Live and Let Die," which preceded the first encore of "Yesterday," "Get Back" and "Helter Skelter." The second encore began with "Please Please Me," continued with "Let It Be" (played on psychedelic-themed upright piano topped by a candle) and ended with a guitar-heavy version "Sgt. Pepper's Lonely Hearts Club Band." The show ended at about 11:30 p.m. with a hail of confetti. Who was that young man on the KeyArena stage singing Beatles, Wings and Paul McCartney songs Thursday night? It couldn't have been a 63-year-old man. Paul McCartney looked remarkably young — especially following the wrinkly Stones, who played the same place Sunday — and sounded much the same as he did in the Beatles, many years ago. He fit right in with the four young guys in his band (the hair dye helped), and had even more energy. Compared to the Stones show, which featured whiz-bang effects, including a stage that floated across the room, McCartney's performance emphasized music. The staging was impressive, especially the massive, busy lighting effects and creative use of video screens, including giant ones behind the stage. The bright lights often shone into the audience, which seemed to unite McCartney with the fans. "Let me drink this in," he said, his eyes sweeping the whole packed hall. The generous, 36-song set included 24 Beatles songs, highlights of Wings' career and cuts from his solo albums, including four from the new "Chaos and Creation in the Backyard." He saluted the other Beatles, which got a standing ovation. The set featured the first song they ever recorded, "In Spite of All the Danger." Perhaps as a tribute to Seattle's own Jimi Hendrix, McCartney, on guitar rather than his usual bass, added a bit of "Foxy Lady" to Wings' "Let Me Roll It." The show opened with a DJ spinning deconstructed, remixed McCartney songs for 20 minutes, followed by an excellent 11-minute film on McCartney's life and career, with his own narration. McCartney and his four-piece band opened with "Magical Mystery Tour," as the entire crowd leaped to its feet. He followed with the weird, obscure "Flaming Pie," the propulsive "Jet," a sweet "I'll Get You" and a song McCartney noted he played at the Super Bowl in February, "Drive My Car," with speeding race cars on the big screens. "Hello, Sea-at-le," McCartney said, promising a long night of music. "We have come to rock you and rock you we will!" Among songs that energized the big, multigenerational crowd — the two kids in front of me in $250 seats, who couldn't have been older than 12, were ecstatic — were "Maybe I'm Amazed," "Fixing a Hole," "Good Day Sunshine," "Band on the Run" and "Back In The U.S.S.R."
McCartney played piano on several songs, including a moving "Hey Jude," with his bandmates supplying fine harmonies and the audience singing the "nah nah nah nahs" with Sir Paul conducting. The main set concluded with the big production number, the bombastic — literally, with booming pyro — "Live and Let Die." The two encores consisted of high-energy Beatles songs. The first opened with his masterpiece, "Yesterday," and rocked with "Get Back" and "Helter Skelter." The second opened with the early Beatles' "Please Please Me," followed by the wise "Let It Be," and ended with "Sgt. Pepper's Lonely Hearts Club Band" and "The End." Paul McCartney is the most revered living rocker on the planet. As such, he could have easily sleepwalked through a predictable list of Baby Boomer favorites and still left the nostalgic masses that filled KeyArena Thursday night feeling warm and fuzzy – even the faithful that paid an obscene $250 a pop for the best views. And, of course, many of the most memorable pop songs of the past 40-plus years were in the mix, too, providing too many feel-good highlights to recall in this space alone. The evening’s low point was a misguided train wreck of a DJ set, delivered by a masked turntablist, that seemed horribly mismatched with the mostly middle-aged contingent that stared on. A 10-minute biographical film followed before the curtain went up to reveal McCartney and his crack four-piece outfit – guitarists Rusty Anderson and Brian Ray, keyboard player Paul “Wix” Wickens and rotund-but-energetic drummer Abe Laborial. McCartney and company kicked off with two punchy selections that were absent from the trek that stopped by the Tacoma Dome in 2002. “Magical Mystery Tour” and “Flaming Pie” came from the Beatles’ 1967 TV special and McCartney’s 1997 album respectively. At 63, the rock legend’s voice still sounded crisp and vibrant. And he still appeared to be having a lot of fun – maybe as much fun as his audience – as he cracked jokes and hammed it up between songs, often lifting his guitar triumphantly overhead like a heavyweight championship belt. The early part of the set included Wings hit “Jet,” “I’ll Get You,” “Drive My Car,” “Let Me Roll It” (with a few licks from Jimi Hendrix’s “Foxy Lady” thrown in for good measure) and “Got to Get You Into My Life” (aka McCartney’s ode to the weed). “Behind me will magically arise a piano,” McCartney said, arms outstretched as a black Yamaha rose out of the stage. Anderson got to introduce the “Fine Line,” the brassy number that leads off “Chaos.” “English Tea,” “Follow Me” and “Jenny Wren” also came from the new CD. “Jenny Wren” – a pensive, poignant number in the tradition of “Blackbird” – was the best received. “English Tea” felt overly precious, and the superior “Vanity Fair” would have been a more desirable choice. McCartney introduced pre-Beatles number “In Spite of All the Danger” by explaining that the Quarrymen had recorded one copy of the song for 5 quid and that everyone in the band had agreed to keep the recording for a week each – that’s until pianist Duff Lowe wound up hanging onto it for 23 years. McCartney went back to 1968’s “The Beatles” (aka the White Album) for “I Will.” And a few songs later it was a more familiar ballad. He explained that the melody from “Blackbird” had evolved from a specific way he used to screw up while playing Johann Sebastian Bach. Highlights from the latter part of the set included “Good Day Sunshine,” performed with images from the space shuttle Discovery. It was the first song the crew heard the day it came home from July’s snake-bitten mission, McCartney said. McCartney played “Yesterday” on acoustic guitar. “Get Back” and “Helter Skelter” followed, with first-person footage from a roller coaster ride on the towering video screen behind the band during the latter. McCartney picked an appropriate one-two punch for the closer. Psychedelic lava lamp colors bubbled across the video screens during “Sgt. Pepper’s Lonely Hearts Club Band (Reprise),” then the band segued directly into “The End” before taking a bow.